Home > Blog > April Already?! Oh hi April, didn't you just sneak up on us! We've got a mega busy month ahead here at Alphabet Bags HQ! We will be launching our new range of summer/travel bags and pouches and hopefully introducing our birthstone enamel pin collection. We will also be finalising our first ever range of greeting cards, a collection of little ombre pouches as well as working on lots of new items for Christmas!! New month also means a new birthstone! 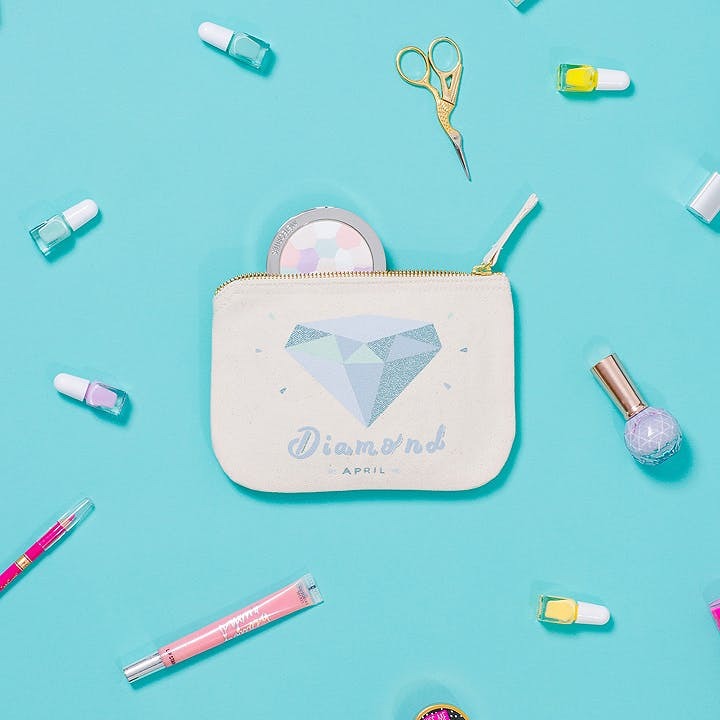 If you've got a April birthday or know someone who has then do take a peek at our dazzling Diamond pouches. This is one of our absolute favourite birthstones. Our beautiful little birthstone pouches make the perfect birthday gift, if we do say so ourselves! Fill with sweets, treats and little trinkets and you've got birthdays sorted. These canvas pouches are super handy, perfect for storing all sorts of bits and bobs, from make up to money and all other handbag essentials. They also make a rather lovely pencil case. Check out the diamond pouch by clicking here. Wishing all April babies a wonderful birthday and hope everyone else has a fantastic month!